What if Bill Bradley, not Al Gore, had secured the 2000 Democratic Party’s presidential nomination? And what if Bill Bradley, rather than George Bush, had then been elected president? How different might the country, society, and the economy be today? While his new book does not address these questions, it does reveal a sense of history, a sensibility, and an agenda for the 21st century that reflect a different view of the world, the country’s policies, and its priorities we see and hear coming out of Washington today. 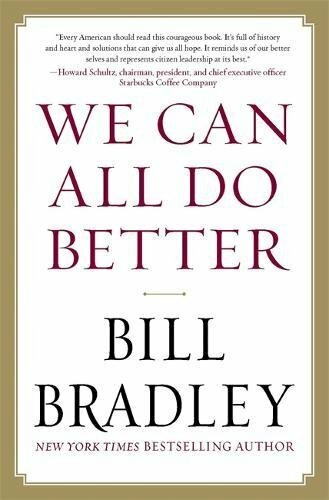 Bill Bradley believes we can be and do better than we are today. Formerly New Jersey state senator, Bill Bradley now works as an investment banker and hosts the weekly “American Voices” radio show, in which he tells stories of good deeds and people practicing purposeful rather than random kindness. In We All Can Do Better he makes the case how this brand of decency; added to greater responsibility by the country’s citizens, reform of the political system, teamwork such as that exhibited by a consistently a winning team, and savvy Eastern-style thinking to inform international policy can together lead the country to a better tomorrow. The challenges are especially daunting, for the country has accumulated unprecedented debts, which funded economic shortfalls rather than investments in infrastructure, education and training, and greater productive capacity. There is encouraging precedent in the form of the evolutionary expansion of the voting pool: proceeding from the original Constitutional provision limiting voting to white males of property, to add all white males (1840s), African American males (1870), women (1920), Native Americans (1924), District of Columbia citizens (1961), lowering voting age to 18 (1971). What is needed, the author advocates, is breaking up the American political party duopoly to allow more accountability, initiative, and innovation. This system reform is on the horizon through American Elect, an online means of participating in the political process independent of and separate from the established political parties. Prospectively, a viable third party candidate shall be on the ballot for the November 2012 Presidential election. For all of the strengths of We Can All Do Better—and there are many—this book does not directly confront the most daunting challenge to governance: how place choice has fundamentally transformed the reality and expectations of government’s scope of services, sources of revenues to fund those services, and its power to act, compel, and control. With people less anchored to a particular place, mobility and migration patterns shift the character and costs of needed public social services, complicate the priorities and concerns of place stakeholders, and challenge connecting taxation collection to value that is created in a fluid rather than fixed place context. That said, We Can All Do Better is a book that every responsible citizen should read, reflect on, and consider in determining which candidate to back in the upcoming elections.